Since 2011, ILRI and its partners in the public, private and non-profit sectors have pursued a comprehensive research agenda aimed at designing, developing and implementing market mediated index-based insurance to protect livestock keepers from drought related asset losses, particularly those in the drought prone Arid and Semi-Arid Lands (ASALs). We have partnered with Oromia Insurance in Borana, APA insurance in Marasabit and Isiolo, and Takaful Insurance in Wajir. 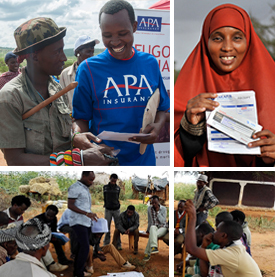 In Isiolo, World Vision International will be responsible (with our technical and capacity backstopping) for supporting APA Insurance with extension, marketing and delivery of sales.